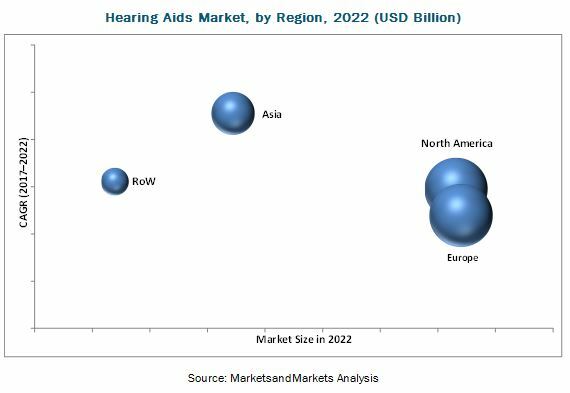 [186 Pages Report] The hearing aids market is expected to reach USD 9.78 Billion by 2022 from USD 6.56 Billion in 2016, at a CAGR of 7.0% from 2017 to 2022. The study estimates the hearing aids market size for 2017 and projects its demand till 2022. This research study involved the extensive use of secondary sources; directories; databases such as Hoovers, Bloomberg Business, Factiva, and OneSource; white papers; annual reports; company house documents; and SEC filings of companies. Secondary research was mainly used to identify and collect information useful for the extensive, technical, market-oriented, and commercial study of the global market. 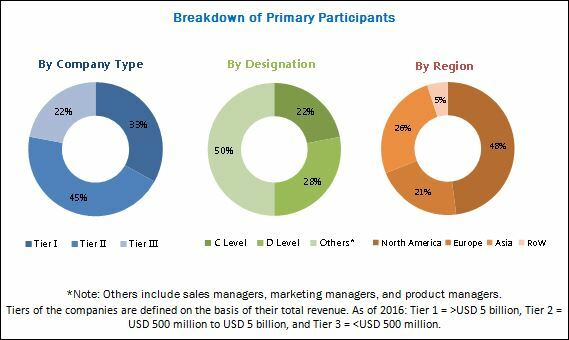 It was also used to obtain key information about the market classification and segmentation according to the industry trends, regional markets, and developments related to market and technology perspectives. In the primary research process, various sources from both the demand and supply side were interviewed to obtain qualitative and quantitative information for the report. Primary sources from the demand side include various industry CEOs, vice presidents, marketing directors, technology and innovation directors, and related key executives from the various players in the hearing aids market. For the market estimation process, both top-down and bottom-up approaches were used to estimate and validate the market size of the global market as well as to estimate the size of various other dependent submarkets. All possible parameters that affect the market covered in this research study have been accounted for, viewed in extensive detail, verified through primary research, and analyzed to get the final quantitative and qualitative data. This data was consolidated and added with detailed inputs and analysis from MarketsandMarkets and presented in this report. The global hearing aids market is projected to reach USD 9.78 Billion by 2022 from USD 6.97 Billion in 2017, at a CAGR of 7.0%. Factors such as high prevalence of hearing loss, rising geriatric population, and technological advancements in hearing aids are driving the global market. Based on the patient type, the market is segmented into adult patients and pediatric patients. The adult patients segment is expected to register the highest CAGR during the forecast period. The high prevalence of hearing loss in the adult population with growing age is driving the growth of this segment. In 2017, Europe is expected to dominate the market, followed by North America. The high growth of the hearing aids market is attributed to growing aging population and high prevalence of hearing loss in the region.